Ahhh….Summer is just about here, and that means many of us are looking forward to cookouts with family and friends. Sunshine, water fights, laughter, delicious food, bonfires… I can almost feel the warmth of the flames and smell the smoke as I imagine our marshmallows roasting over the fire. Yes, summer get togethers bring fond memories. For many of us, when we think of a summer get together, we can’t help but feel our mouths water as we think on all of the delicious food–grilled burgers, hotdogs, watermelon. Yum. 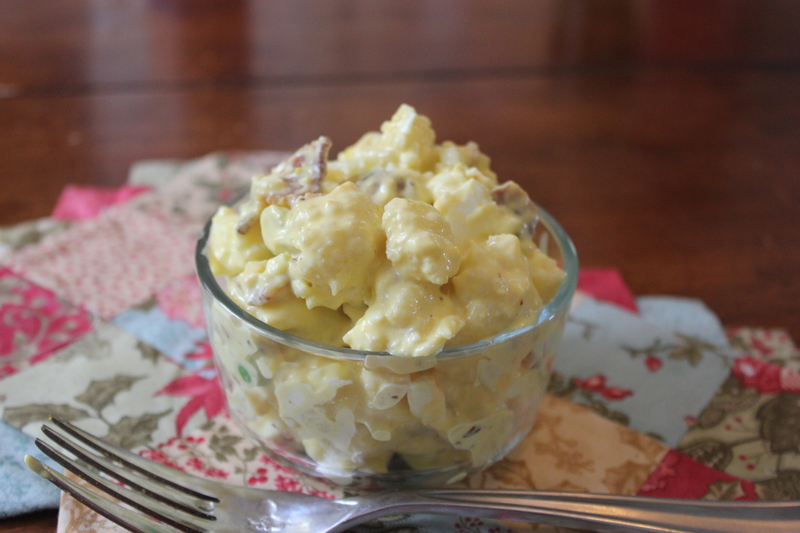 I don’t know about you, but one food that I particularly enjoy is a potato salad done well. But, I also know that I don’t do as well with nightshades (which, obviously potatoes fall within this category). So, you can imagine my delight when I came upon a “nightshade”-free version of this recipe from Janel over at NellieBellie. And you know what? It is awesome. Thank you, Janel, for this delicious side dish! Made with a base of cauliflower instead of potatoes, this “no”tato salad is full of health benefits. According to Dr. Mercola, cauliflower can be called a “superfood” as it poses several benefits: “It fights cancer, boosts heart health, is ant-inflammatory, is rich in vitamin C and K, is a good source of protein, thiamine, riboflavin, niacin, magnesium, phosphorus, fiber, B6, folate, manganese, pantothenic acid,and potassium, it supports brain health, is a support for detoxification, poses digestive benefits, and is rich in antioxidants” (Mercola). Oofta! I don’t know about you, but it makes me want to grab a big bowl of this “no”tato salad right now! I love this recipe because it is simple, delicious, and is absolutely a dish you could bring to a potluck this summer. Enjoy this “no”tato salad recipe! And thank you, again, to Janel for this. I made just slight adjustments from her recipe, so if you want to see the original, just click here. Enjoy! 1. Cook the cauliflower until al dente. Drain and set aside to cool. 2. Mix the remaining ingredients, except the chives, in a medium-sized bowl. Add the cooked cauliflower and stir everything together gently. 3. Sprinkle the fresh chives on the top. Cover and refrigerate at least 3 hours before serving.